We were scheduled to start car the show at 9:00 a.m., folks started arriving at 7:30 a.m. The morning went by fast and folks were doing a lot of talking about the features of their cars and/or the ideas about the features of their cars. Before we knew it, it was time for Lunch and in the next moment it was time to award the Trophy to the winners of the various classes. We would like to thank Jackie Brion, Ken Brion, Bill Willen, Kathy Brion, Sharon Benson, Steve Gartner, Jim Heaton, Adam Lombard, Steve Lombard, Carl Palczewski, Dave Cohen, Mike Lawrence, and Smitty for their help in setting up and breaking down the Car Show. 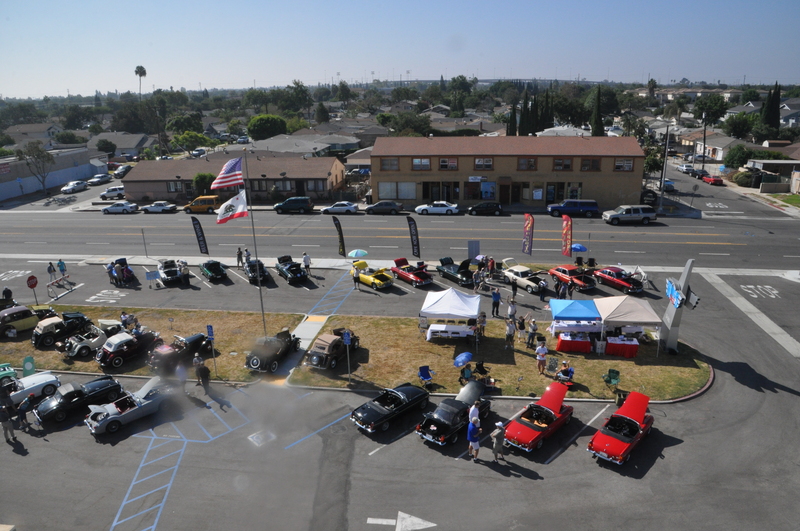 I cannot express enough how appreciative I am of Connie Wyckoff of North American MGB Register, Joe Siam of Chequered Flag, Moss Motors, Fullerton Airport, Wings Cafe, and everyone else who donated items for raffle and silent auction. Photographs and Show Winners will be posted at a later time. Zelda’s Car in Front of a classic aircraft.